Learn to play children's song Twinkle Twinkle Little Star in the key of D Major in this beginner piano lesson. I show how to play each hand in detail so you can easily follow. You can download the sheet music for the lesson below. 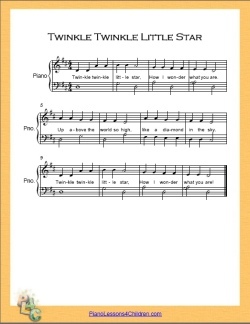 Here isright is a printable sheet music (PDF file) for the song "Twinkle Twinkle Little Star". It has notes, chord symbols, and the lyrics. Use it while studying these lessons.